Urbano Build is a vibrant Community within the wider Urbano network, with over 800 member and associates companies, include architects, property professionals, developers, designers, landscape architects, BIM specialists, environmentalists, engineers, M&E, BIM build tech & software developers, etc. Our Urbano Build speaker programme has a proud track record of exploring and championing issues affecting the sector, often before they become mainstream. This includes diversity, sustainability, new technologies and their usage, such as BIM and VR, accessibility, BREAAM, supply chain opportunities, site safety, workplace and wellbeing, design, modern materials, M2M/IOT and crowdfunding. Urbano Build breakfast events are stripped down conferences where the focus is on networking and faciliating valuable connections. Our Build speaker programme has a proud track record of exploring and championing issues affecting the sector, often before they become mainstream. This includes diversity, sustainability, new technologies and their usage, such as BIM and VR, accessibility, BREAAM, supply chain opportunities, site safety, workplace and wellbeing, design, modern materials, M2M/IOT and crowdfunding. 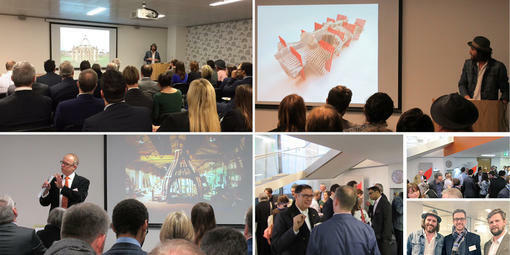 Previous speakers at Urbano Build have included RIBA’s current and previous Presidents, Kevin McCloud (Grand Designs), George Clarke (Restoration Man), Alan Crane (on regulation post Grenfell), Wayne Hemingway, Loyd Grossman, David Hancock (Government Lead on Construction), senior figures in organisations like CEBR, BRE and CABE, and from leading UK construction companies such as Arup, Laing O’Rourke, Mace Group, etc. Teresa Gonzalez Rico - Future Cities Catapult Project Lead - is a Civil and Structural Engineer with several years of experience in the construction industry. Over the last four years she has worked in the Urban Innovation space, focusing on the impact that the built environment has in Cities and people, and how the way we build and manage our infrastructure can make smart cities a reality. Teresa was also Programme Manager for one of the workstreams at the Centre for Digital Built Britain (CDBB). CDBB is a partnership between the Department of Business, Energy & Industrial Strategy and the University of Cambridge to deliver a smart digital economy for infrastructure and. Building on work already begun by the UK BIM Task Group, the Centre for Digital Built Britain team is leading the next stage in the UK construction industry’s digital evolution. Teresa’s presentation will set out the road map for BIM Level 3 and beyond – looking at the challenges and complexity within cities, the role of infrastructure and how BIM can support new solutions for a more efficient, outward-looking and productive built environment. Urbano Network is London’s largest independent business networking community with over 5,000 Member & Associates, with member companies ranging from SMEs to corporates and PLCs, hosting a diverse calendar of weekly events across our Communities: Build, Finance, Host, Media, People, Tech & UWACTE. Urbano is a powerhouse of connections and opportunities. Our searchable database and unique online toolkit allows our members to find new opportunities with other members and associates between events. We also actively facilitate connections between members and produce a Tenders & Supplier Opportunities list every Tuesday. For details on the latest list, click the tab on the right.